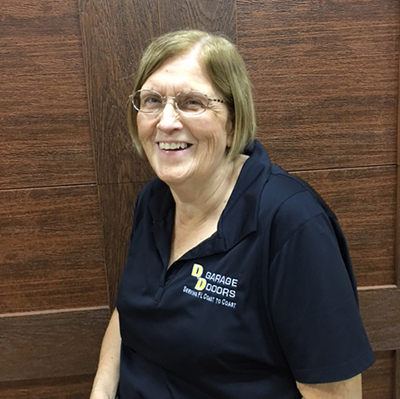 Hi i’m Debbie and I have been with D & D Garage Doors Orlando for 5 years now! Before D & D Garage Doors I worked for Windsor Door for over 10 years. What attracted me to D & D Garage Doors Orlando was the family feeling we have now matter how big we grow. I am originally from upstate New York and my family had moved down here so I moved as well to be closer to family. A unique thing about my family is that we are super close, I have 2 brothers and 2 sisters. D & D has also really supported my family by support us at the ALS walk each year, a disease which has personally affected my family. The most important part of my job is making the customers feel like they are part of our family. 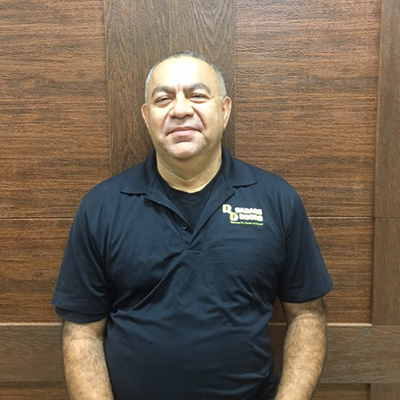 What I love most about my job is the people and one great thing about D & D Garage Doors Orlando is that we are all family! 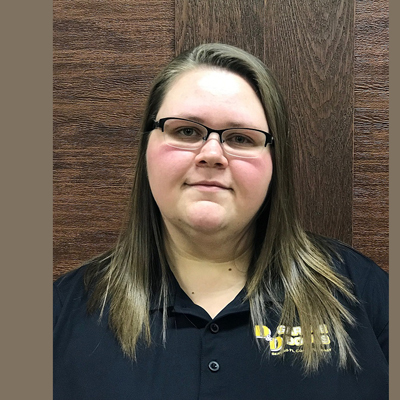 My name is Ginny Davis and I joined the D & D family in December of 2011. Previously, I worked for Hormann LLC (Distribution Center in Orlando that sold Garage Doors) almost 5 years until they closed their doors in Florida. I am originally from Illinois but I have been living in Florida for over 20 years. My husband Michael and I have been together for 25 years and counting & we have a wonderful daughter finishing up at the University of Central Florida. The best part of my job is talking to all of our wonderful customers. 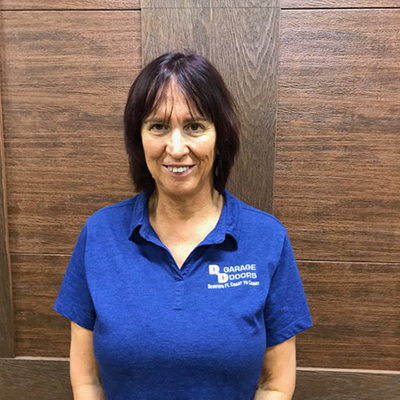 I always make sure I am able to help them understand the types of garage doors that are on the market and I help them choose the best door to fit their needs. So much has changed in the garage door industry over the last 10 years, I love all the different garage door models, colors, designs, and options. We can fit anyone with a garage door that would go with the style/architecture of their house. I really enjoy helping people and I invite all of you to visit our design center here in Orlando to pick out the best garage door for your home. 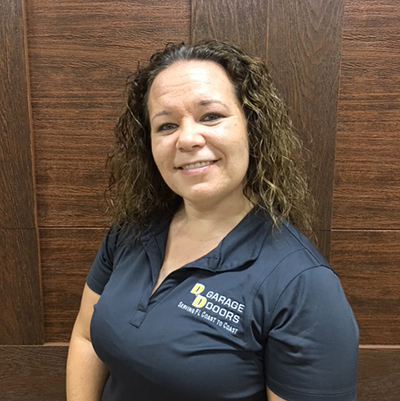 Hi my name is Pam and I am your scheduler here at D & D Garage Doors in Orlando. I am new to the D & D family, joined the team in September of 2013. My background is in customer service and bookkeeping so my job as a scheduler comes second nature. I love that we are able to offer homeowners so many options for their garage doors — garage doors are not just plain white anymore, we not only help customers with problems but we help enhance their curb appeal and I love that! I am a true Floridian born and raised right here in the Orlando, FL area. I have a beautiful 10 year old daughter who keeps me pretty busy with karate and of course, school work. The best part of my job is being able to assess our customers’ situation and schedule them as soon as possible. When our customers can’t get in or out of their garage they need our help fast. At D & D Garage Doors, we are not just a company — we are family! Hi I’m Maureen. 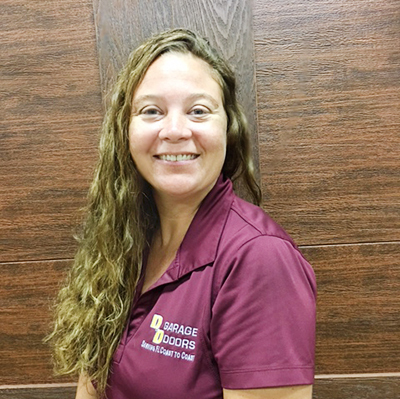 I’ve been at D & D Garage Doors a few months now, but before that I worked in the Mental Health field for over 5 years and enjoyed helping service our Central Florida children. In the early 2000’s I worked in Dispatching for furniture distribution company and learned to route our drivers to get through the crazy traffic of central Florida. I was attracted to work at D & D Garage Doors due to the family orientated atmosphere. 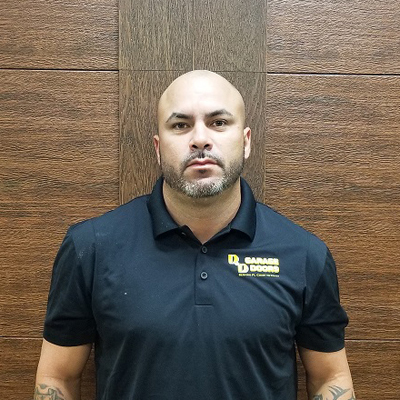 I am strongest at communicating with both customers and our services installers and contributing to the family atmosphere and positive environment. Bringing a family happiness with a new addition to their home. Between the styles and colors of a new garage door it really brings the home to a new level. Hi I’m Charlie! I am new to the D and D Garage Doors family, but I have been in Sales for years. I’m originally from Connecticut, but as most of us northerners are, I was looking for a change in weather and a new start. I moved down to Florida and I am so glad that I did. My favorite aspect of my job is meeting our homeowner’s showing them options that fit and will work best for their home and their budget. 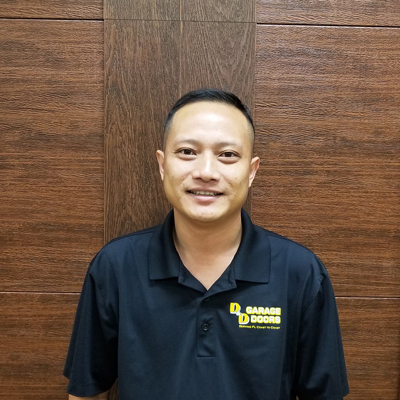 I joined D and D Garage Doors in Orlando because of their high quality, integrity, and the attention to detail they give to each and every customer. I am very dedicated to what I do and I enjoy doing sales both in the showroom and out on the field. 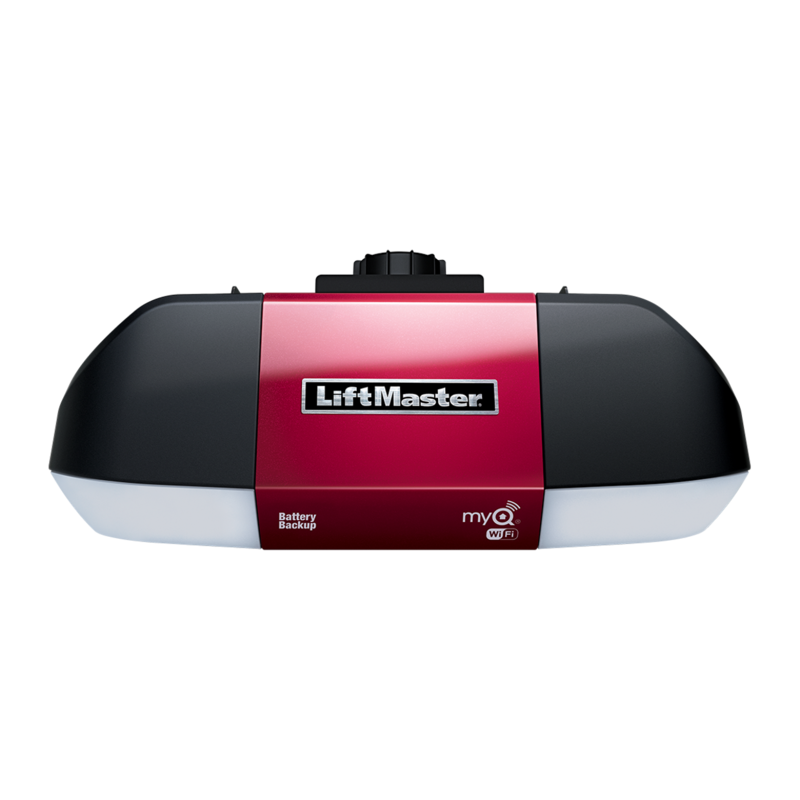 If you are looking for a new garage door stop by our Orlando Garage Door Design Center or call and schedule an appointment with me right away! I would love to meet you. Hi I’m Amanda! 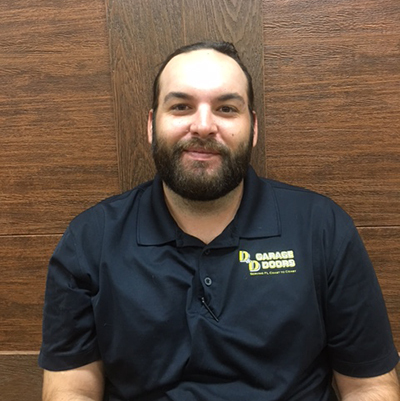 I have been with the D & D Garage Doors Orlando family since 2014 and my position is sales. 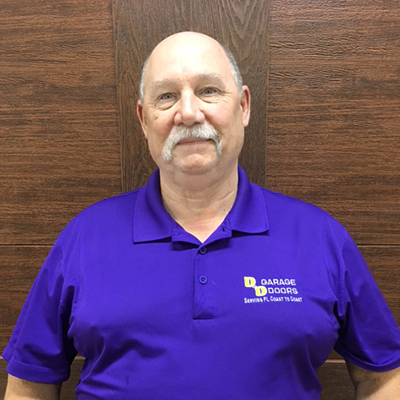 I have been in the garage door industry for a few years prior to D & D. My training includes Dale Carnegie, Manufacture one-on-one and marketing through college. I can handle the smallest of residential projects with a homeowner to a full on custom, more complex commercial job with our builders. I am excited to be part of the D & D team, they are a large stable company who supports their staff like family. I am a true Floridian, born and raised in the Lake Mary, FL area so naturally one of my favorite hobbies is to fish, spend time with my family and our 2 dogs. The most important part of my job is showing our homeowners how a garage door can change the entire curb appeal of there home without breaking the bank. I love teaching people that it’s not just a garage door, it’s a statement that affects the entire curb appeal. In addition to servicing residential we focus on commercial as well. Our builders are not customers to me, they become friends and they know they can call me anytime and I will be there to help. 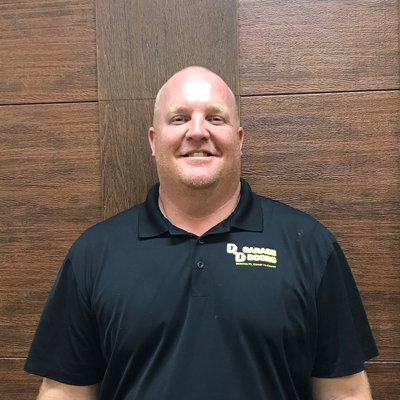 Serving on the Board of Directors and being very active at the local Home Builders Association: Greater Orlando Builders Association (GOBA) is very important as we want to be active in the community we serve. I am excited to be part of this wonderful organization … The support that is offered by all coworkers at is outstanding, we truly are a big family. 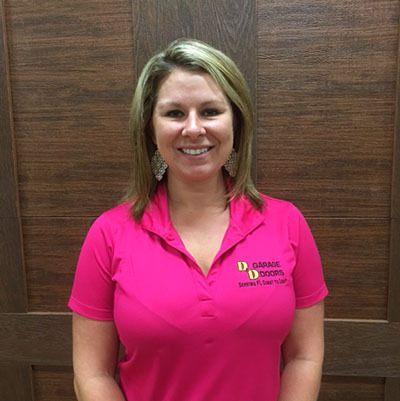 Hi my name is Victoria and I have been working for D & D Garage Doors Orlando since early 2019. Before D & D Garage Doors I was working with Children in the District and the elderly in my neighborhood. 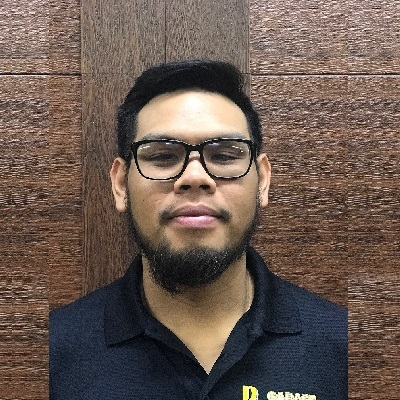 What attracted me to D & D Garage Doors was that I had heard such wonderful things about the company and that everyone was treated like family. I am originally from California but moved to Florida as a child and grew up here. Something unique about myself is that I am always trying to learn new things like a language or instrument. The most important part about my job is making sure the customers get what they need and that they are satisfied from our service. What I love most about my job is helping people and learning new skills. 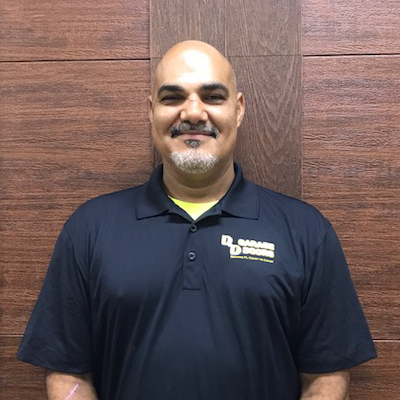 One thing about D & D Garage Doors Orlando is that no matter who you are or what you need you will always be treated like family when you walk in. 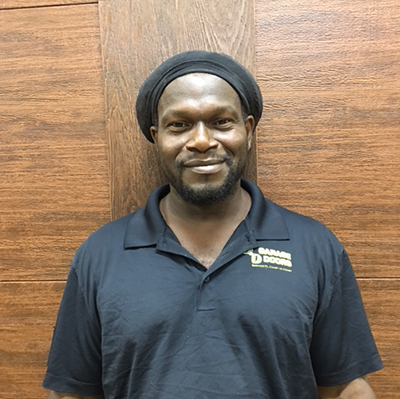 Hi i’m Willie and I have been working with D & D Garage Doors Orlando for about a year and a half! I have 16 years experience in the service industry working for other companies. What attracted me to D & D Garage Doors Orlando was job security. I am originally from Puerto Rico and a unique thing about me is that i like to help others. The most important part of my job is making sure the customer is satisfied when I have finished the project. What I love most about my job is the chance to service others. One great quality about D & D Garage Doors is that it is a good company and it makes you feel like family. 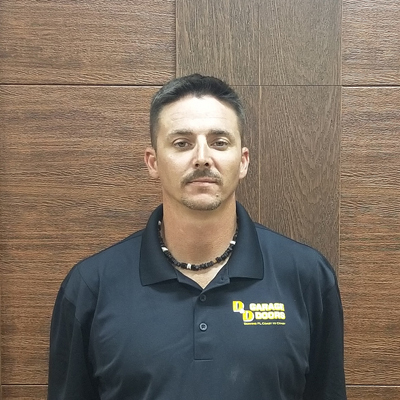 Hi my name is Steve and I have been working for D & D Garage Doors Orlando for a little over 3 years. 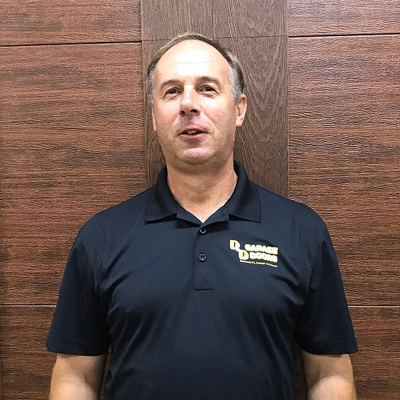 I have been in the Garage Door business for 10 years on and off in Connecticut, Arizona, and Florida. What attracted me to D & D Garage Doors was that I like the work that I do and I am very service driven. I am originally from Connecticut but moved to Arizona for a few years and then finally moved to Florida. Something unique about me is that I am very interested in Video Games and would love to learn how to program. The most important part of my job is being honest, I refuse to sell people things they don’t need and feel taking the honest approach is the best policy. An informed decision isn’t a sale…it’s integrity. What I love most about my job is helping strangers with their problems, constantly learning and perfecting my skills. 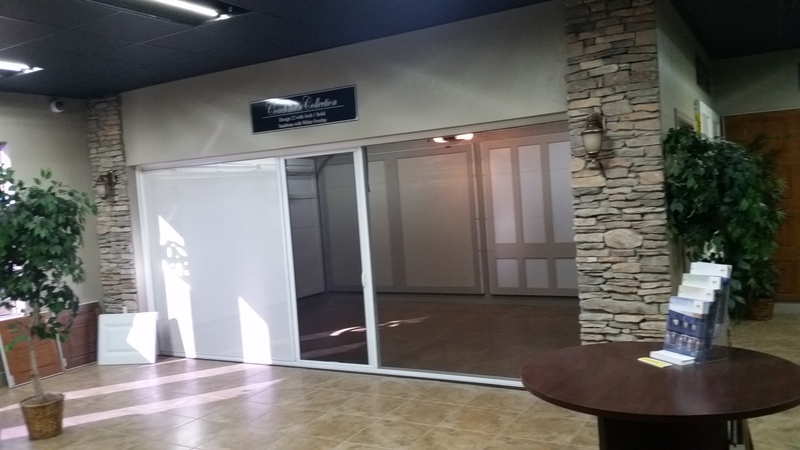 One thing about D & D Garage Doors is that we will handle you. Ups and downs with honesty and professionalism. No one will do it better than us. 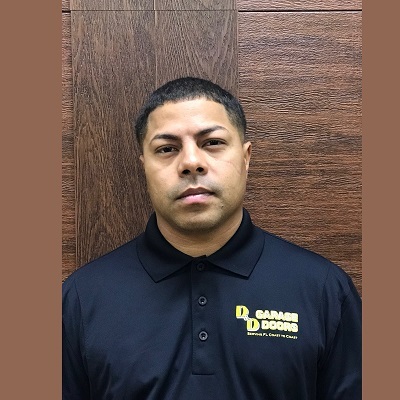 Hi my name is Victor and I have been working for D & D Garage Doors Orlando for about 3 or 4 years now. Before D & D Garage Doors I did a few different things like Customer Service, Shift Manager and a Delivery Driver. 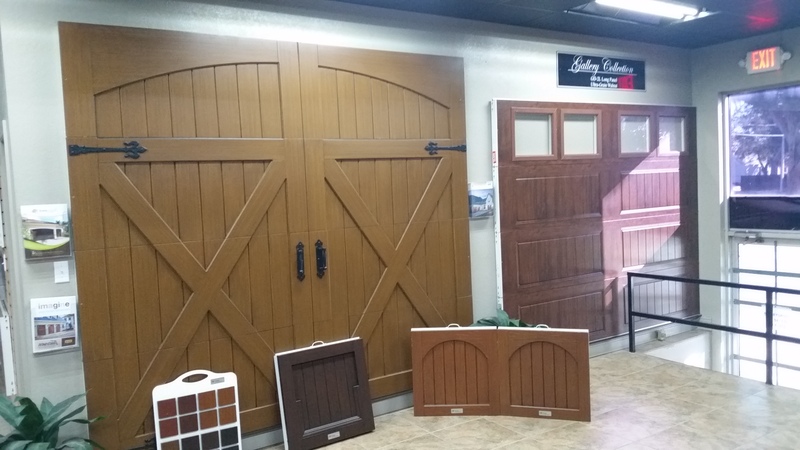 What attracted me to D & D Garage Doors Orlando was that I was searching for a new opportunity. Something unique about me is that I am soon to be married! What I feel is most important about my job is that it is completed in a timely and professional manner. Making the customers happy is what I love most about my job. 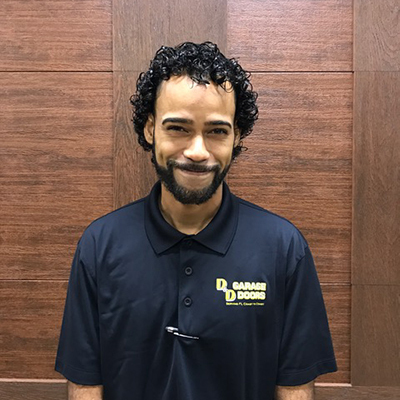 Hi my name is Dominique, i’m a Garage Door Installer and I have been working with D & D Garage Doors Orlando for 5 years now. What attracted me to D & D Garage Doors was that it was a good job. I am originally from Orlando, FL. A unique thing about my family and I is that we are a fun group of people! The most important part of my job is making sure the customer is always happy. What I love most about my job is the work I get to do. If I could say one thing about D & D Garage Doors is that it is very family orientated. 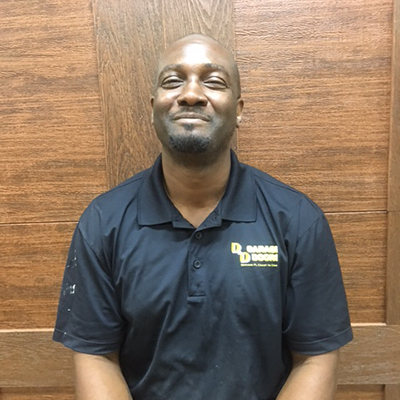 Hi my name is Dwain and I have been working for D & D Garage Doors Orlando for about 4 years now. Before working for D & D Garage Doors, I worked in welding. I am originally from Vermont and then moved to Florida. The most important part about my work is just getting the job done in a timely manner. One great thing about D & D Garage Doors is that it is a great office and the people feel like family. 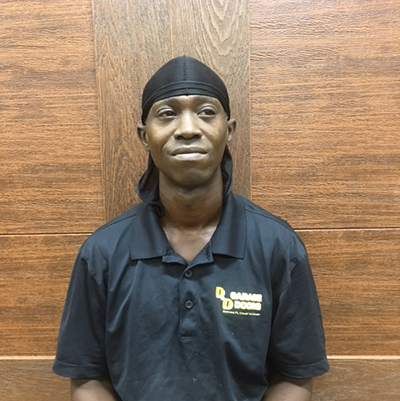 Hi i’m Ferdinand and I have been working at D & D Garage Doors Orlando for 5 months now. I previously worked at AutoZone for 11 years in Retail Management. What attracted me to D & D Garage Doors was that it’s a stable and growing company. I was born in Puerto Rico but have been in Florida for almost my whole life. What I feel is the most important part of my job is putting a smile on the customer’s face. I love everything about my job and D & D Garage Doors is a great company! 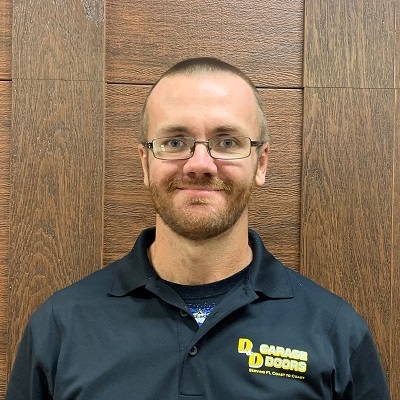 Hi my name is Kevin and I have been working for D & D Garage Doors Orlando for a little over a year. Before joining D & D Garage Doors I did pressure washing and also did construction jobs. What attracted me to this job was the organization of the company and overall I just liked the job. I am originally from El Progreso, Honduras and I moved here with my family. The most important part of my job is making our customers satisfied and for them to see how organized we are as a company. What I love most about my job is the freedom it gives me to complete my projects. This is one of the best companies I have worked for. 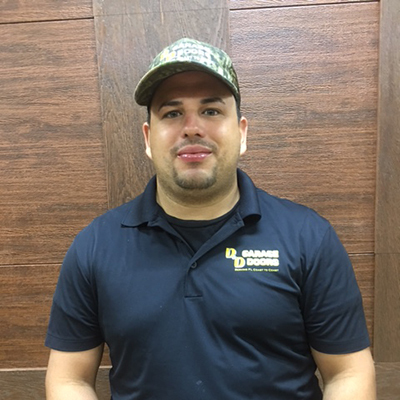 Hi my name is Luis and I am an Installer at D & D Garage Doors Orlando. I have been working here for a 2 and a half years now and previously I worked at Walt Disney World. What attracted me to D & D Garage Doors Orlando was the good working environment here and the chances of always learning something new everyday. I am originally from Puebla City, Mexico and came to the United States 3 years ago with the help of my mother. Something unique about my family and I is that we are all very close and always in contact. Even though I live far away from all of them we always make time to talk on the phone or video chat with one another. The most important part of my job is giving the best quality of my job in every single install. I want our customers to feel satisfied and know I have done my best work. 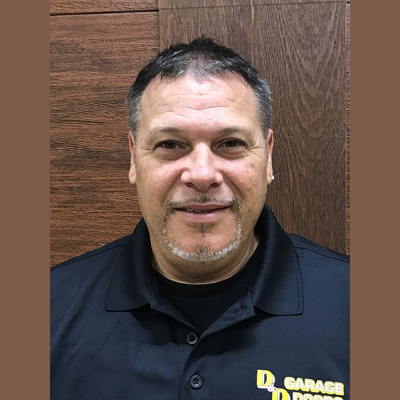 What I love most about my job is the good friendships I have made when working here at D & D Garage Doors and one great thing about this company is that we only do the best work because that’s just who we are. 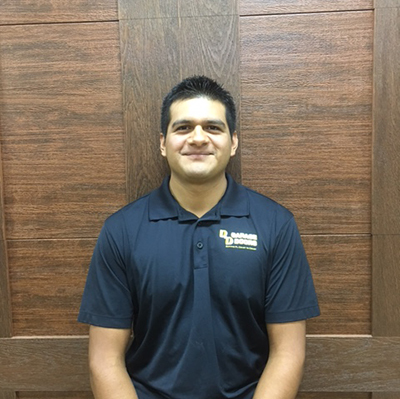 Hi i’m Nelson and I’ve been working for D & D Garage Doors Orlando for a little over a year! Before D & D Garage Doors I did all types of work like Heavy Equipment Operator, Electricity, Plumbing, Home Remodeling and Auto Detailing. 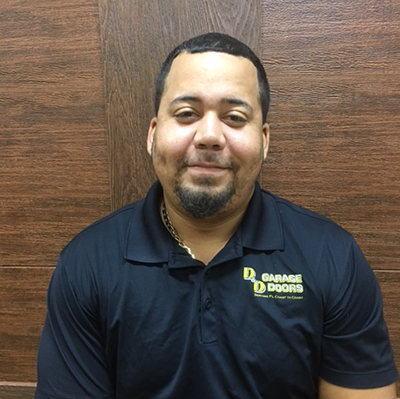 I was interested in working for D & D Garage Doors Orlando because it was a stable company with good leadership and I have an opportunity for growth within the company. I was raised in Florida for the majority of my life and something unique about myself is that I am very determined to progress in life. I feel the most important part of my job is Customer Satisfaction and Quality Work, which both equal to a happy customer. What I love most about my job is being able to help people solve their problems and issues. One thing you need to know about D & D Garage Doors Orlando is that we hold ourselves to a high standard and we are determined to give quality service. 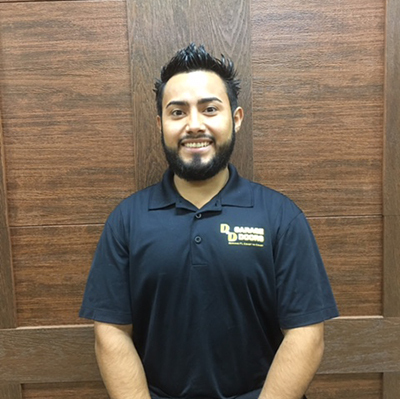 Hi my name is Rey and I am an Installer for D & D Garage Doors Orlando. I have been working here for about a year and a half. Before Working for D & D Garage Doors I did work in Electrical. I am originally from Albany, Georgia but the heat is what brought me to Florida. One thing that is unique about my family and I is that we all have a great sense of humor. The most important part of my job is having all the necessary tools to complete the job. What I love most about my job is getting to see all the different issues I get to deal with on a day to day basis. 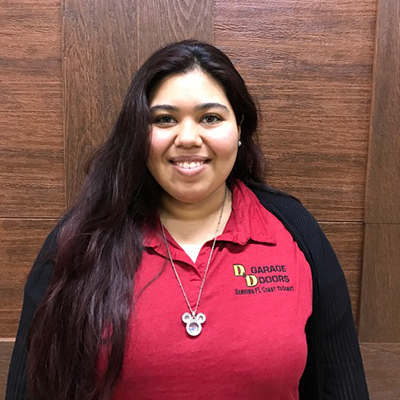 Hi my name is Gaby and I have been working with D & D Garage Doors Orlando for about a month now. Before joining D & D Garage Doors I worked in Automotive Refinishing. 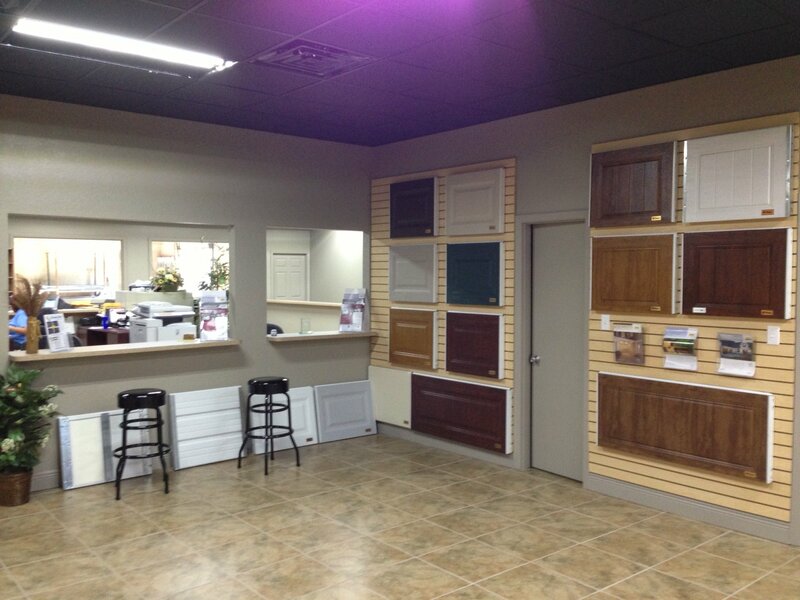 What attracted me to D & D Garage Doors Orlando was that I always heard great things about the company. I am originally from San Juan, Puerto Rico and a unique thing about my family is every male in my family has the same middle name, Jose. The most important part about my job is accuracy and adapting to constant changes to ensure the customer is satisfied. What I love most about my job is the people I work with everyday. If I could say one about D & D Garage Doors is that they are attentive. Hi I’m Kaytlin and I am Orlando’s CSR.